IQ caps is designed to support an active lifestyle. This can be beneficial for sports, studying, gaming or any other activity that requires your full concentration. These comparable needs require a controlled energy level and prolonged concentration, for example athletes will notice a better mind-muscle connection, students will be able to study more efficient and gamers can keep their concentration and focus for a longer period. IQ caps will give you the edge! 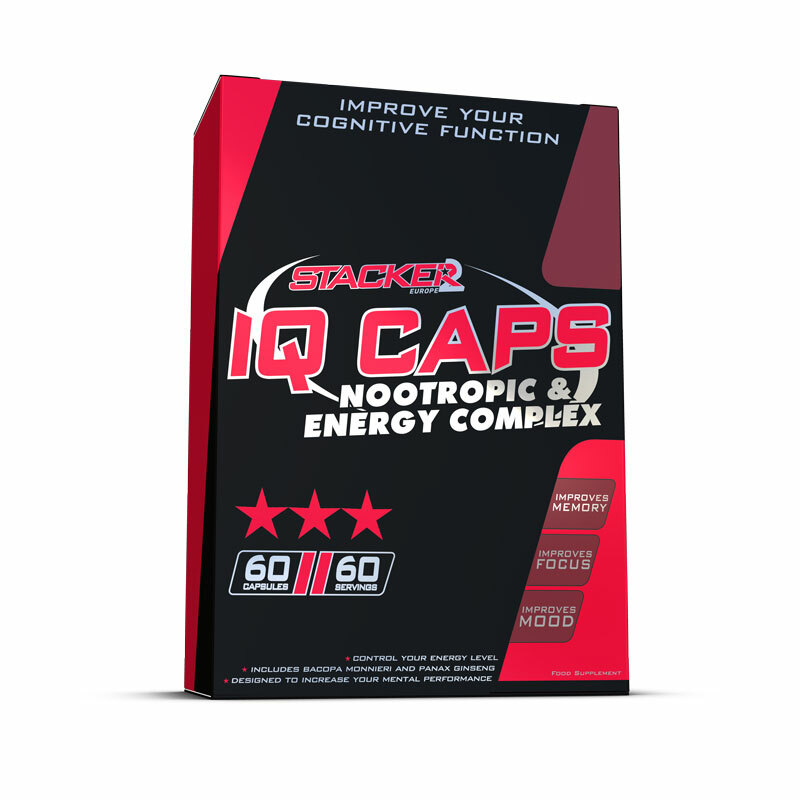 IQ caps has a unique mix of nootropic ingredients combined with stimulants. Nootropics are compounds that enhances the brains function and increases the focus towards concentration, memory, mood and enhancing your cognitive potential. The main ingredients are the well-researched ingredients Bacopa monnieri and Panax ginseng. Next to the nootropic ingredients we provide you the energy you need to stay alert and reduce tiredness. 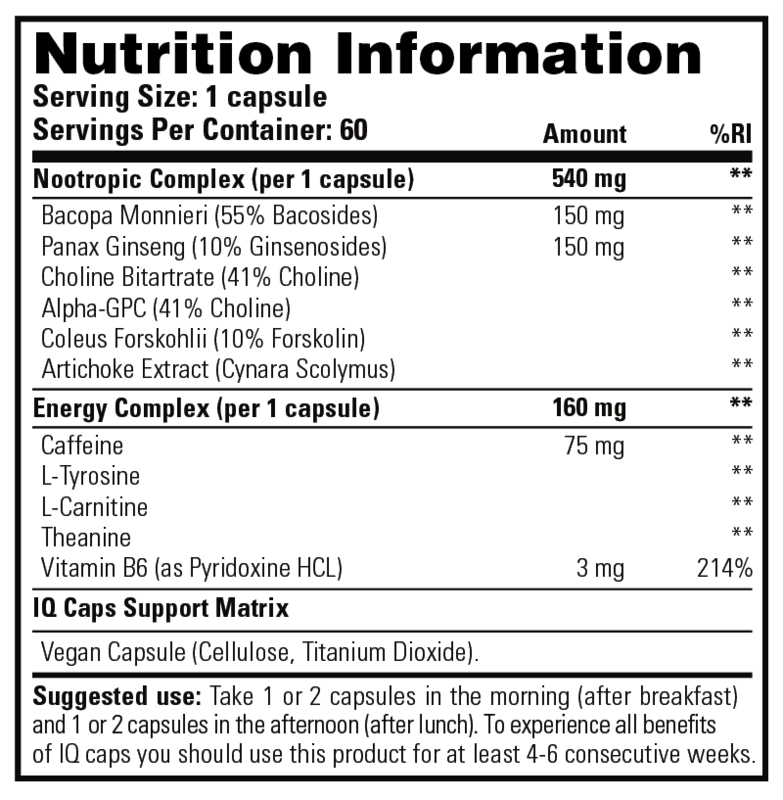 Caffeine, L-Tyrosine, L-Carnitine, Vitamine B6 and Theanine are involved in IQ Caps. *Statements are Scientific supported through independent studies and have not (yet) been evaluated by the EFSA. Caffeine content (75mg per capsule). This is a food supplement. Food supplements should not be used as a substitute for a varied diet. This product is to be used in conjunction with a sensible diet and exercise program for best results. Please store in a cool, dry place and keep out of reach of children. This product is not intended for anyone under the age of 18. This product is not intended to diagnose, treat, cure or prevent any disease. Do not use if you are pregnant or lactating. Consult an expert if you also use other supplements and stimulants (like caffeine). Don’t use if you have heart or vascular disease, high blood pressure, diabetes, glaucoma, thyroid, kidney or prostate problems. Never exceed the recommended serving. Nootropics are compounds that enhances the brains function and increases the focus towards concentration, memory, mood and enhancing your cognitive potential. The main ingredients are the well-researched ingredients Bacopa monnieri and Panax ginseng. Take 1 or 2 capsules in the morning (after breakfast) and 1 or 2 capsules in the afternoon (after lunch). To experience all benefits of IQ caps you should use this product for at least 4-6 consecutive weeks.